Научный журнал «Вестник ВятГУ»The English version of the site is under reconstruction. Английская верcия сайта находится на реконструкции. 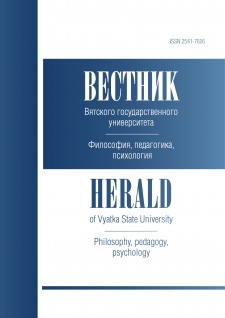 About the journal "Herald of Vyatka State University" (published since 1996) is the scientific journal, articles and materials of which reflect the main research directions of Vyatka State University, scientists of Russia and foreign countries. In the "Herald of Vyatka State University" the directions are presented: philosophical sciences. The journal is registered in Federal service for supervision in the sphere of communications, information technologies and mass communications (Roskomnadzor). The certificate of registration of mass media (PI № ФС 77-67510 of October 18, 2016) "Herald of Vyatka State University" is included in the List of leading reviewed scientific journals and editions in which basic scientific results of dissertations on application for a scientific degree of Doctor and Candidate of Sciences should be published. 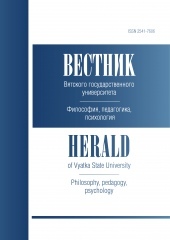 In 2014 the scientific journal "Herald of Vyatka State University" is published monthly. You can subscribe through post office. Subscription index in United catalogue "Press of Russia" – 94029. The authors of submited materials are responsible for the selection and accuracy of facts, quotations, economic and statistical data, proper names, geographical names. The submitted materials must be original and not previously published in other publications. The editorial board reserves the right to make editorial changes (without changing the meaning) in the original text. In case of refusal of reviewing the author's manuscript, the editorial board sends the author a reasoned response. The editorial board adheres to ethical standards of publications. In its editorial work the board uses one-side “blind” review with the involvement of 2 professionals and more.